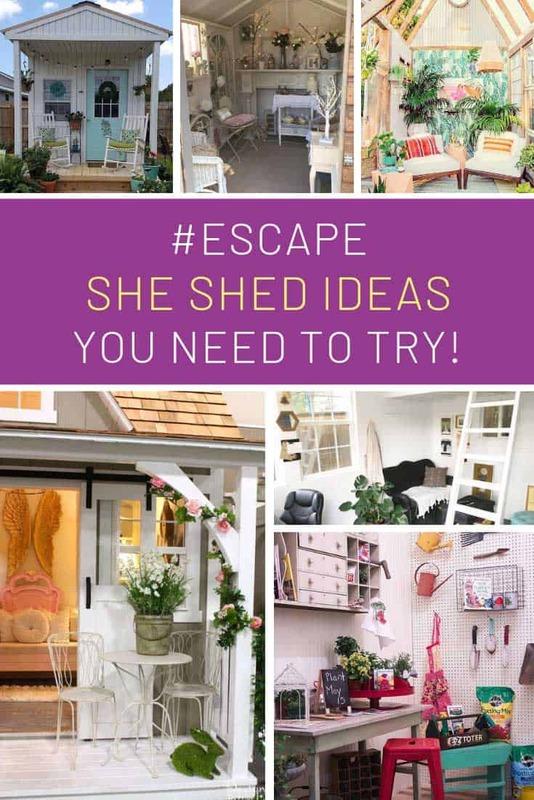 17 Fabulous She Shed Ideas You'll Want to Escape to! 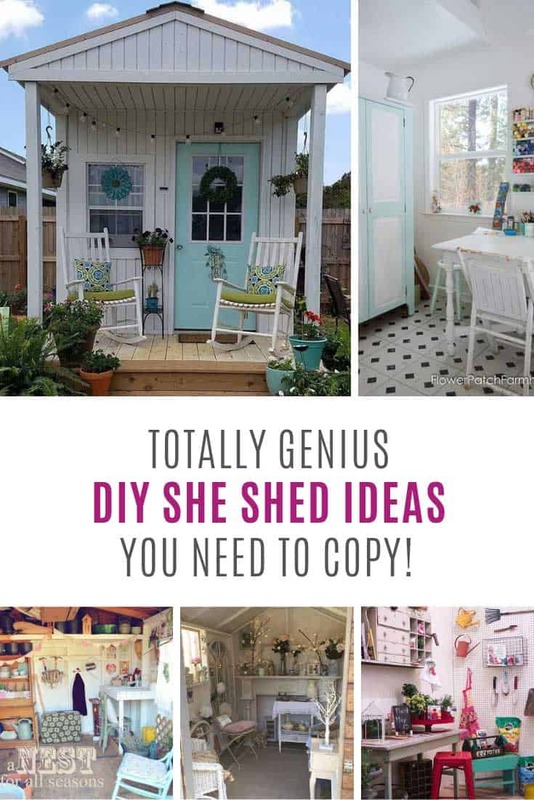 Home > DIY Projects > 17 Fabulous She Shed Ideas You’ll Want to Escape to! If you yearn for some space of your own but your kids have taken over the house it’s time to move out to the garden. Not outside in the elements, but in a room of your own at the bottom of the garden. 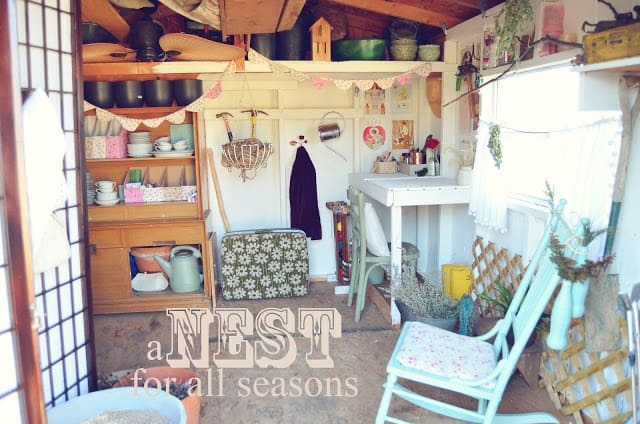 Whether you want space to sew, craft, read or just enjoy afternoon tea in peace you need to check out these gorgeous she shed ideas to see how it’s done in style! Vintage finds, a mantle piece and fairy lights all add to the shabby chic feel here. 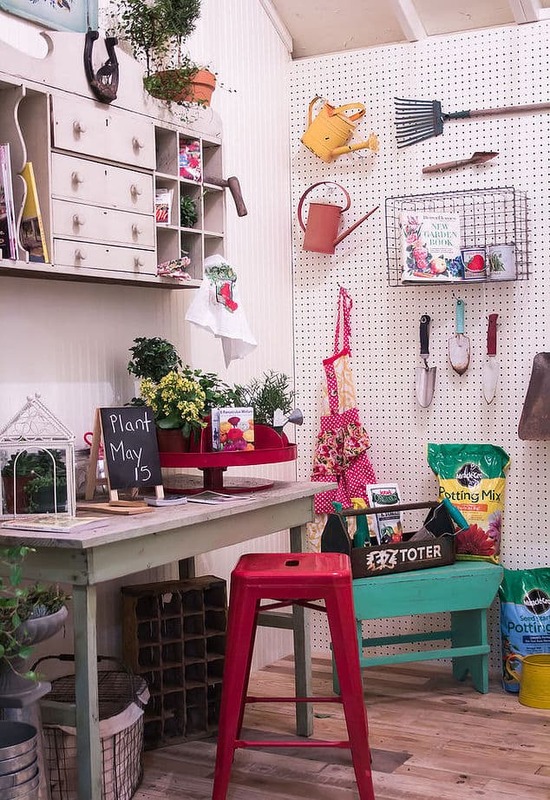 Bring your potting shed to life with vintage finds and plenty of colour and storage options. 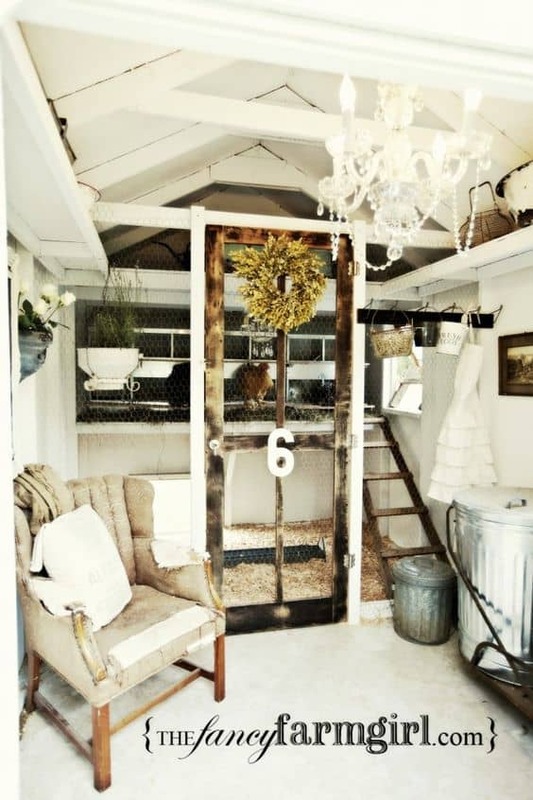 If you love spending time with your chickens why not make your she shed a shared space, where you can sit and read while they keep you company! 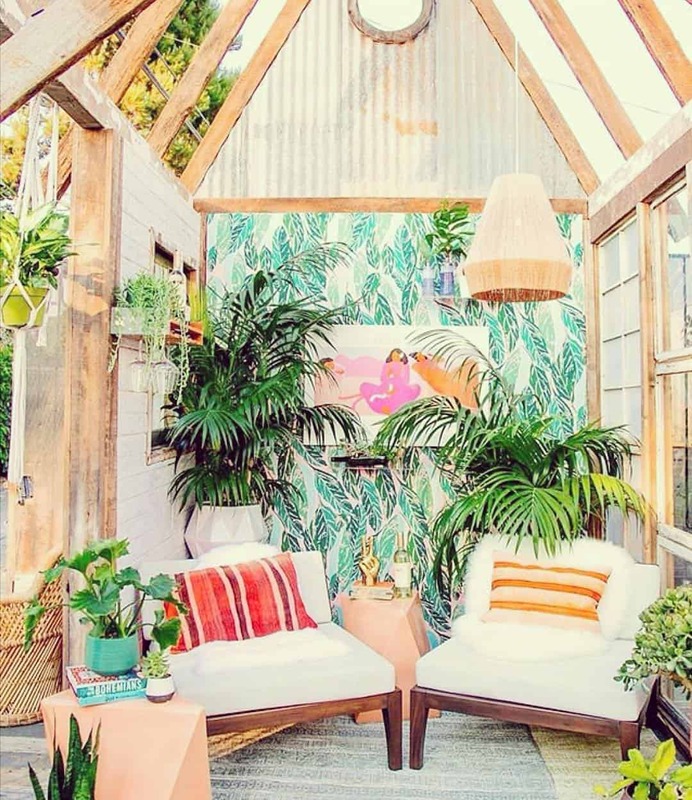 Don’t forget to bring in some greenery to your she shed, and be brave and try wallpapering in there too! 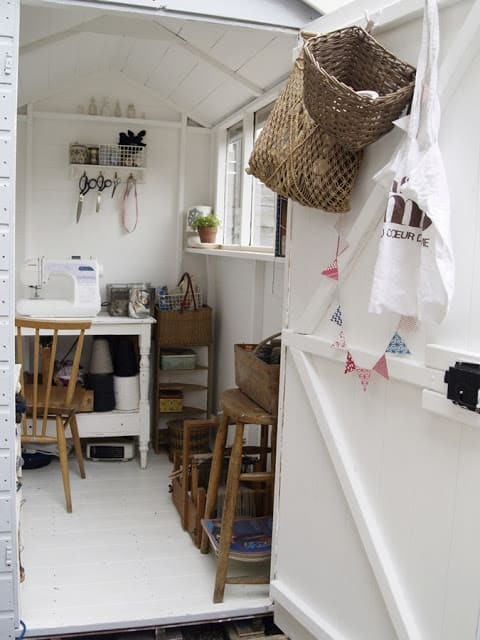 Don’t worry if a 4×6 foot shed is all you have to work with, with some careful planning you can still make the space work for your needs, like this perfectly formed sewing space. Don’t despair if there isn’t enough room in your backyard for two sheds, just tell your man he has to share! 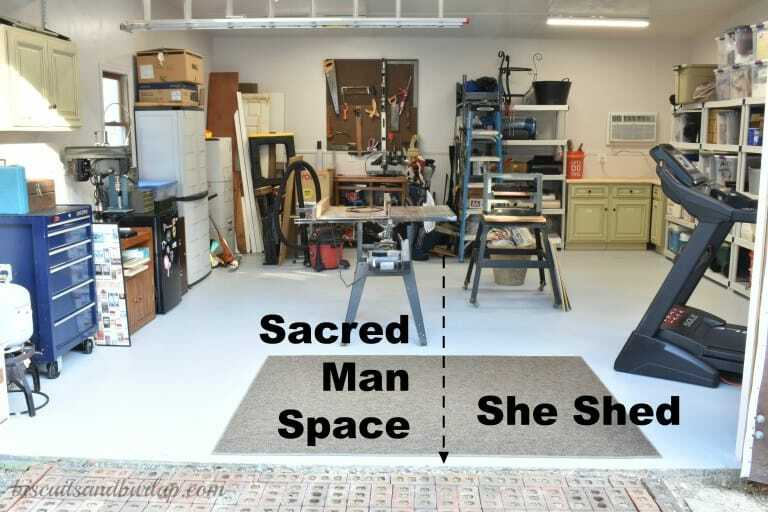 Here’s an example of how your she shed can coexist with your man’s sacred space. If you can’t bear to look at all of his tools and mess then try hanging a curtain across the middle or making a pretty divider. 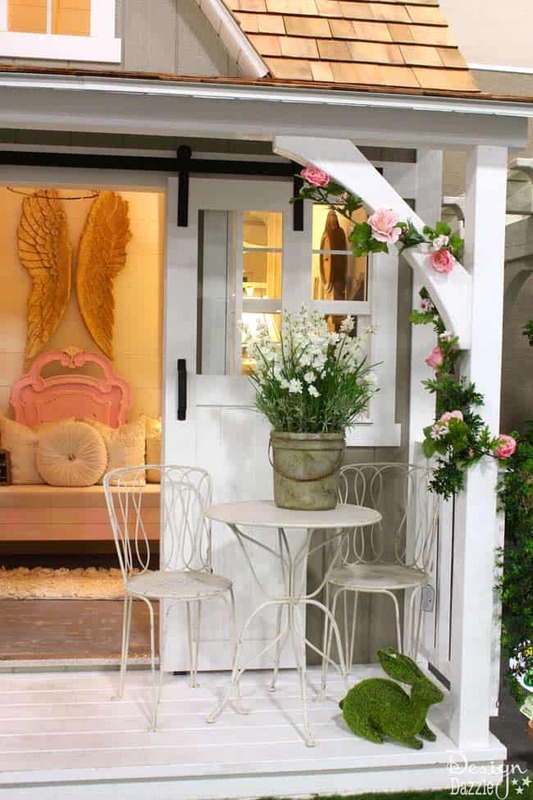 Don’t forget to make the outside of your she-shed look pretty with a fabulous paint job! Bright white walls and furniture are the perfect backdrop for your colourful craft creations! Your she-shed doesn’t need to have an active purpose, if all you want to do is kick back and relax with a pot of tea then go for it! We love the thrifted hutch in this crafting space that is perfect for storing supplies, and of course the bunting! 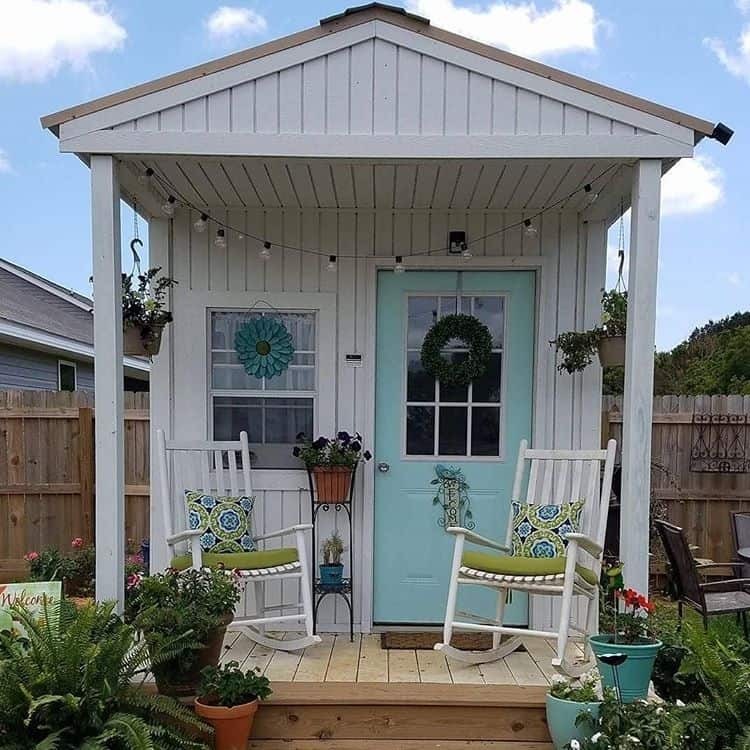 Don’t forget the outside space around your she shed, this one has a fabulous porch complete with rocking chairs that’s a perfect spot for a lazy Sunday afternoon. 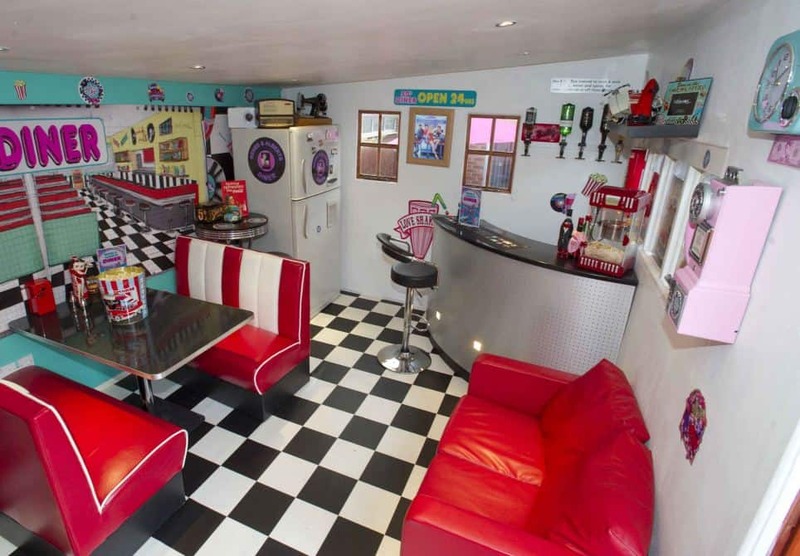 If the Fifties is your favourite era why not make yourself a Fifties diner in a shed in your grand, just don’t forget the jukebox! 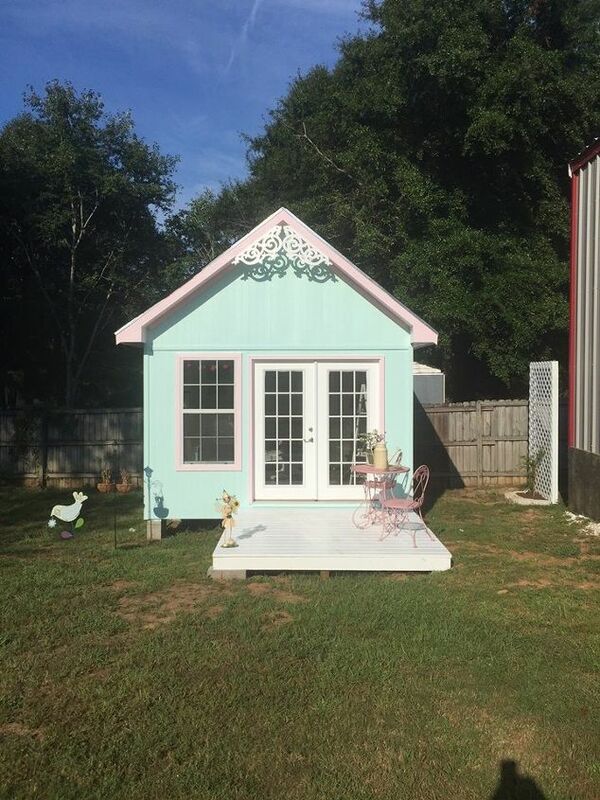 Kelli’s craft shack might look like a boring old shed from the outside but inside it’s a crafter’s dream space, with bright purple paintwork and huge pegboards for storing supplies. 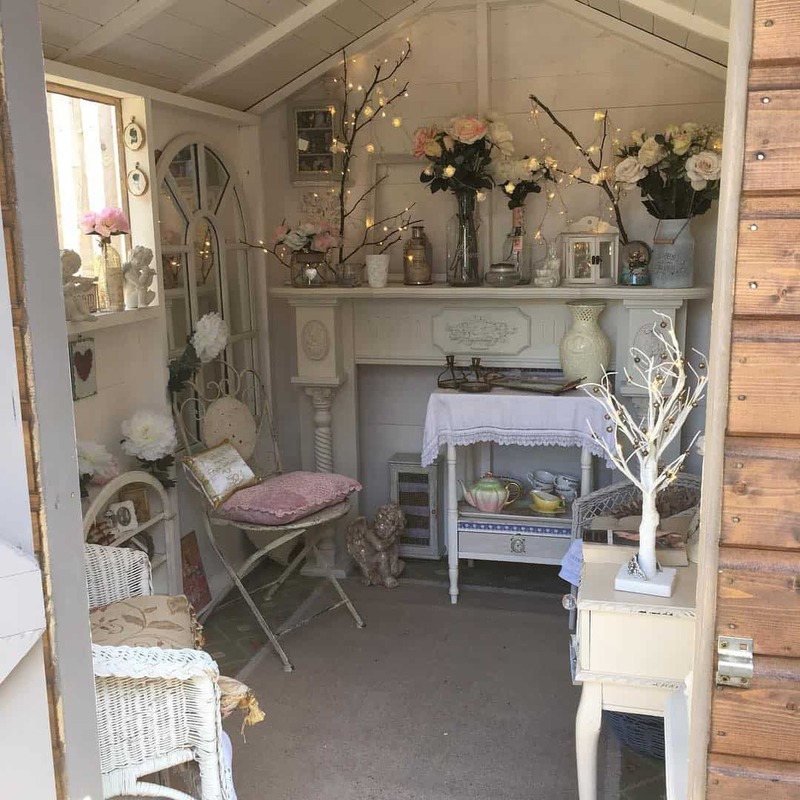 Nobody says that your she shed can’t be used as a shed, but of course a potting shed with a feminine touch has a totally different feel to it than a regular old potting shed! 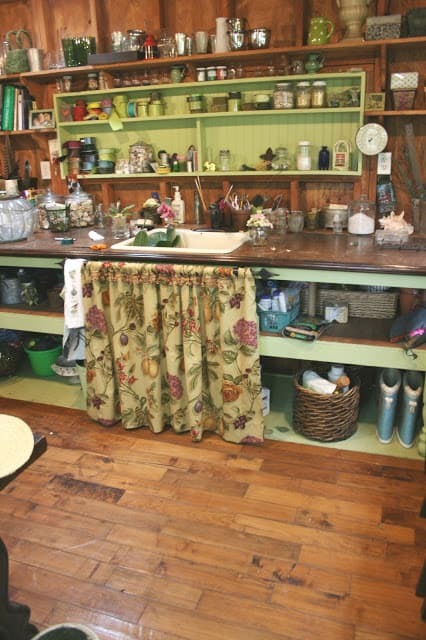 We love how Nancy has all of her garnering supplies displayed on shelves and the curtain under the sink adds a shabby chic feel. Tara describes the “cottage” at the bottom of her garden as her office rather than a she-shed. 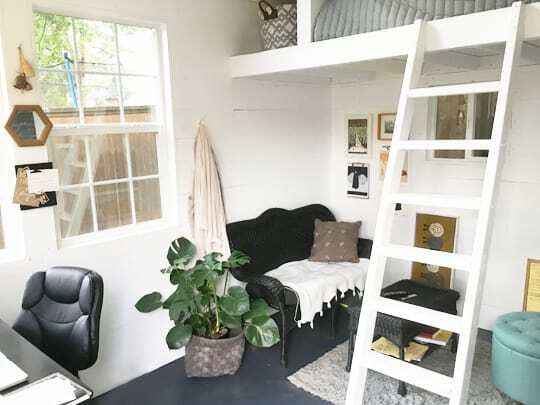 We love that she has space for her writing desk as well as the bunk area for relaxing and enjoying the view through the roof window.